From its early days, the Common Market of the South (MERCOSUR/MERCOSUL) sought to give the regional pact a consumer protection dimension and one of the first consumer topics it tried to tackle was advertising. A Resolution (binding upon member states) adopted by the principal decision-taking body, the Common Market Group (Grupo Mercado Común – GMC), No. 126/96, tackled both misleading and comparative advertising. However, the measure was never fully implemented by member states and for years MERCOSUR did not revisit the issue — until now, that is. In November the GMC, noting MERCOSUR’s poor track record in this area, chose to act on a more narrow focus on false/misleading advertising (publicidad engañosa in Spanish, publicidade enganosa in Portuguese). Some, but not all, of Resolution 45/06 restates parts of Resolution 126/96. The new measure now must be incorporated into the national regulations of Argentina, Brazil, Paraguay and Uruguay (and presumably Venezuela once its MERCOSUR membership is fully ratified). It should be noted that Article 5 of the Resolution makes it clear that this is a floor for national standards, not a ceiling — member states are free to adopt (or keep) tougher measures. The member state which will be affected most is Argentina, the only one whose Consumer Code does not include explicit provisions on misleading or comparative advertising. There are bills pending in Congress to create a special advertising law (see also here and here), but they have not progressed far in the legislative process. Some observers suggest that this is the true impetus behind the MERCOSUR Resolution — to give proponents of an Argentine ad law more ammunition in their push for adoption. This scenario is plausible — while working on European Union (EU) law in the 1980’s and early 1990’s, more than once I saw national officials who could not get measures through their national legislatures push behind the scenes for EU rules so that they could go to their parliament and say, see, we must do this in order to fulfill our EU commitment! 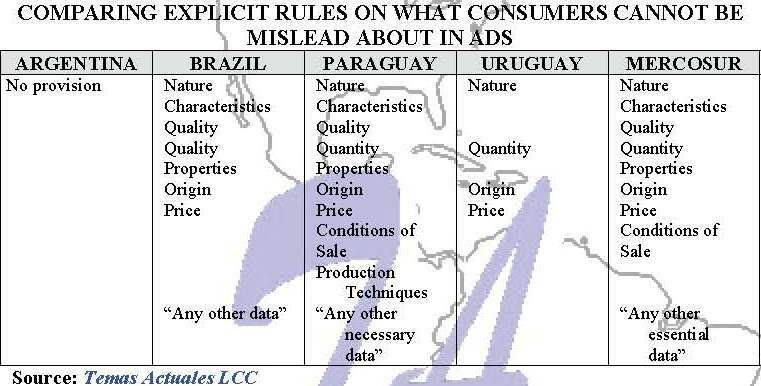 The new GMC Resolution, as did Resolution 126/96, calls for all advertising to “transmitted and divulged in such a way that the consumer immediately identifies it as such, irrespective of communications medium utilized.” Both the Brazilian and Uruguayan consumer laws already have such provisions, although they differ slightly. Uruguay utilizes the “transmitted and divulged” phraseology, while Brazilian law says “conveyed” (veiculada). You may be saying “so what, Keith, you’re splitting hairs.” No, when it comes to the law, word choice is usually key. “Transmitted” and “divulged” are usually carefully defined acts in national communications law. “Conveyed” is much broader, may apply to more interactions, direct or indirect, explicit or implied, between the producer/service provider and the ultimate consumer. Some of the gap between the two may be covered, though, by the MERCOSUR use of “irrespective of communications medium utilized.” Since, near as I can determined, the law of none of the four nations explicitly states coverage of all media, this one phrase will require some tinkering with existing national laws and regulations. The Brazilian law in principle is tougher about ads being identifiable: whereas the MERCOSUR standard requires advertising to be immediately identifiable to the consumer as such, Brazilian law calls for it to be easily and immediately identifiable as such. How meaningful this provision in the MERCOSUR measure is ultimately will rely on member state interpretation and enforcement thereof. How, for example, might it apply to pay-per-post blogs sourced out of MERCOSUR countries? Or infomercials produced or shown in MERCOSUR countries? Or even so-called “product placement” in television shows, movies, video games or music videos? Misleading Ads Are Banned — But What Constitutes a Misleading Ad? cualquier modalidad de información, difusión o comunicación de carácter publicitario que sea entera o parcialmente falsa, o que de cualquier otro modo, inclusive por omisión de sus datos esenciales, sea capaz de inducir a error a los consumidores de cualquiera de los países, cuando la provisión de información refiera a la naturaleza, características, calidad, cantidad, propiedades, origen, precio, condiciones de comercialización o cualquier otro dato esencial sobre productos y servicios que sean necesarios para decidir una relación de consumo. the inclusion of “diffusion” among the modalities covered is in the Paraguayan law; the Brazilian and Uruguay consumer law do not have it. the qualified “omissions” clause (“omission of essential data“) is in the Uruguayan law, whereas the other two do not qualify what types of omission who be considered deceitful (and are therefore, in theory, broader and tougher). 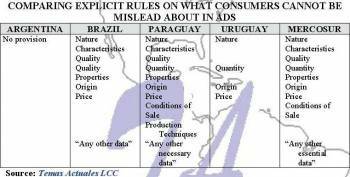 Brazilian and Paraguayan law, like the MERCOSUR Resolutions, include in the list of the types of errors ads must not mislead consumers to make, quality, properties and conditions of sale, Uruguayan law does not. In many nations, the burden of proving that an ad is misleading rests with the plaintiff, whether a consumer, group of consumers (a class action suit) or prosecutor. The MERCOSUR Resolution, as do the consumer protection laws of its three member states, reverses this, making the defendant responsible for proving the ad was not misleading. The difference is who is identified as the defendant — the MERCOSUR text says advertiser (anunciante) as do Paraguayan and Uruguayan law, but only Paraguay clarifies this to specifically mean the provider of good and services being advertised. The Brazilian Code refers to patrocinador, basically the party paying for the ad. Both the 1996 and 2006 MERCOSUR Resolutions require each member state to take measures to ensure that the provider of advertised goods or services keeps a dossier of information substantiating the claims and statements made in its ads. Brazil and Uruguay already have such a requirement, Paraguay does not. Uruguay allows for limits on such requirements, namely how long the provider much keep such a dossier and who can ask for it. A notable difference between the 1996 measure and its 2006 counterpart: added is a sentence saying that the implementation of the Resolution shall be done “observing the criteria of the United Nations Consumer Protection Guidelines.” Most readers can be forgiven if they have never heard of the Guidelines — they are little known outside consumer law circles (and not by all within those circles, I might add!). I happen to know them pretty well, because I tracked and analyzed the negotiations for the original version in the early 1980s. The non-binding Guidelines were approved by the UN General Assembly (UNGA) in 1985 and modified in 1999; they cover in general terms the various elements the UN opines that national consumer protection laws and standards should address. 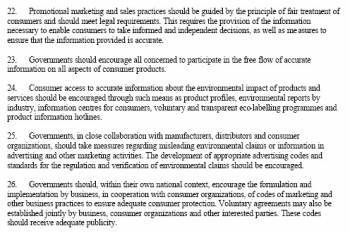 The original Guidelines said little about advertising and promotion, but the 1999 amendment changed that (see box – click to enlarge). 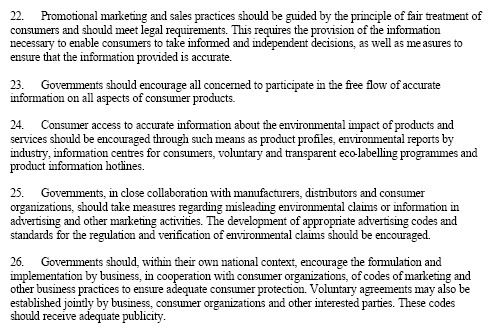 The insertion of the Guidelines reference in the MERCOSUR Resolution is a bit puzzling, since the only passages where the Guidelines speak specifically about misleading advertising is in regard to environmental claims. Does this signify that MERCOSUR intends for this new instrument to be the vehicle through which member states address head-on the issue of environmental claims? Not as far-fetched as you might think! MERCOSUR has contemplated common rules on eco-labeling before, and recently has launched negotiations on clean production, post-consumer producer responsibility for end-of-life products, and standards for environmental goods and services. Does all this actually mean further activity on advertising and promotion at the MERCOSUR level, or at least more concrete activity at the national level as follow-up? Beyond the renewed push for Argentine legislation on advertising, and perhaps some tweaking of the advertising provision of existing consumer protection laws in the other three member states, it is hard to say at this juncture. I would point out, however, that over the last two years the MERCOSUR states have agreed to closer cooperation among their consumer authorities about combating scams involving tourism products and services, and Argentina and Brazil agreed to bilateral cooperation in combating all cross-border consumer fraud. This suggests, it seems to me, that authorities have belatedly awakened to the fact that many of their citizens want not only goods and services to cross national borders within MERCOSUR, but some of the protections they enjoy to do so as well. That was some incredible post. Keep up the good work. I feel diminished in your presence. I recently realized that, despite my blog’s subtitle and mission statement, I had not posted much on consumer protection yet, so it was time to kick some of the draft entries out of the queue. More to come!